Read the brief here. We conducted an extended search of trainings provided by state agencies and service providers that are targeted towards families. 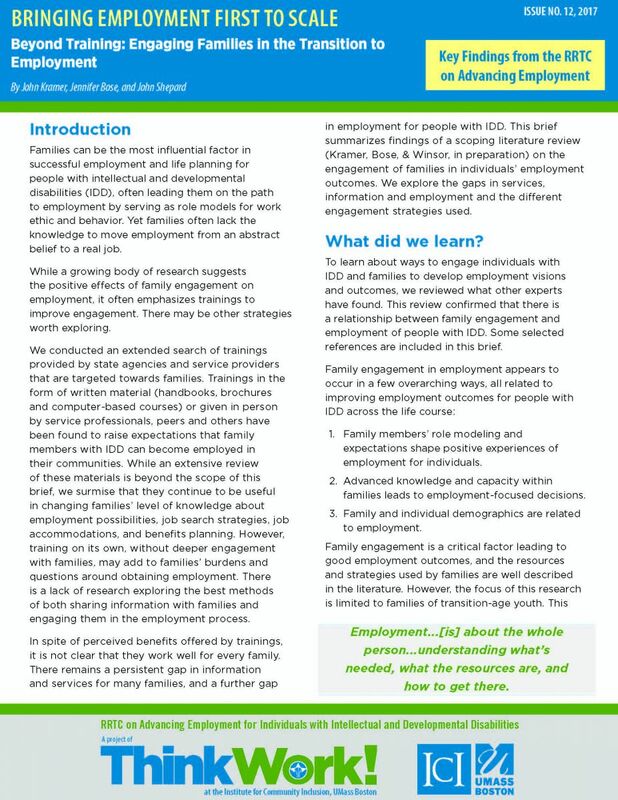 Trainings in the form of written material (handbooks, brochures and computer-based courses) or given in person by service professionals, peers and others have been found to raise expectations that family members with IDD can become employed in their communities. While an extensive review of these materials is beyond the scope of this brief, we surmise that they continue to be useful in changing families’ level of knowledge about employment possibilities, job search strategies, job accommodations, and benefits planning. However, training on its own, without deeper engagement with families, may add to families’ burdens and questions around obtaining employment. There is a lack of research exploring the best methods of both sharing information with families and engaging them in the employment process.